Eight years ago many attorneys asked themselves if they needed a website. Today, similar questions now revolve around social media. I still conduct CLE classes at a number of bar associations dealing with online #lawyermarketing and social media and nothing fills the room like a social media CLE. Why? Because unlike a simple website, social media can be far more complex and difficult to understand for a typically attorney. Moreover, social media is best utilized as a much larger piece of an overall attorney marketing strategy. Until recently, most website authority producing measures had to do with the quality and quantity of inbound links generated to a website. In 2012, Google made 665 reported changes to their search algorithm with arguably the two most sweeping changes having to do with active content (Panda) and bad link building (Penguin). As a result of these changes, we are seeing new sources of authority coming from content distribution points – namely #socialmedia. A recent study by Acend2 indicates that companies with the strongest social media / SEO strategies now produce the best results, and visa-versa. 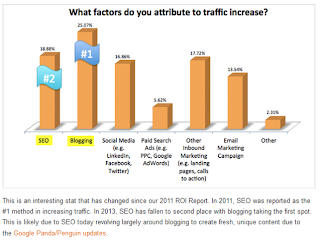 This was further picked up in Search Engine Land when they built on this analysis to point out the important of social media marketing and local SEO efforts. Since most attorney searches are local in nature, this should grab your attention. At the heart of social media is unique content generation and the best place to generate new and fresh content is on a blog. When content is created on a blog, it can be automatically sent to content distribution points where people can more readily see, access, promote, share and act on it. The most effective content distribution points for attorney come from social media (Facebook, LinkedIn, Twitter, Google +, etc.). 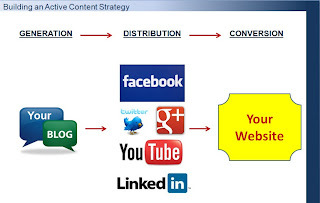 This is what we refer to as an active content strategy – all of the necessary pieces from generation (blogs) to distribution (social media) to conversion (websites) working together. As the search engines like Google are changing from static to a more dynamic content indexing, they face a number of new changes including which results should have the highest authority (and rank) in the SERP’s. Although inbound links (off-site SEO) still remain a critical component to success online, the search engines are finding new ways to create authority from social media. In short, if inbound links serve as “votes” from other websites, what does active content generation and distribution count as and how should it be measured? The most effective way to measure social media content distribution is through “#reach.” Reach is nothing more than a simple measurement of the total number of people who see your social media updates. 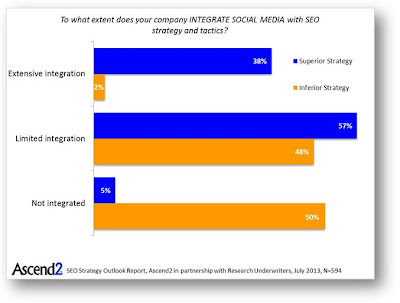 The more people “reached,” the better visibility and potential for new case / client generation you receive. Beyond reach, Google has added one more benefit: authority. Through optimal content flow and distribution of active content, the search engines should be able to source your social media information to a single point. Much like an author will cite their sources in a book, so too will the search engines try to cite the sources of content through citation flows. The more of these citation flows from blogs, news, post, tweets, retweets, Google +, etc., the more potential authority can be gained by the source. For most attorneys, the source is their blog which more often than not resides on their website. When properly executed with all of the pieces working together in an active content strategy, we are seeing around a 30% bump in overall traffic to websites that deploy this strategy compared to firms that do not. This would help reinforce the findings from Acend2 study listed above. In short, authority comes from both off-site SEO (inbound link building) and citation flow (active content strategies). Internet marketing has evolved beyond a simple website. In fact, the technology and market is evolving so fast that what was optimal yesterday may be obsolete today in this competitive framework. Due to the limitations of the search engine battlefield, everything online is a function of competition. If you are not consistently moving forward in action and strategy, you will fall behind – plain and simple. Successful attorneys online have evolved beyond simple products (websites) and now follow additional strategies (active content) in order to stay ahead of the game and maximize new case and client generation efforts. Successful attorney marketing is a journey, not a destination. How you chose to compete ultimately comes down to this simple philosophy. Having an active presence online is paramount for every business to thrive in today's digitally intensive world. Law firms are no exception especially when it comes to expanding their law firm marketing efforts. Social media provides an excellent way for practices to enhance their relationships with their clients through engaging content. As a legal entrepreneur, I ensure that I engage my clients on Facebook and Twitter through quotes, infographics, and blogs. I have also created a YouTube channel which showcases our business events and philanthropic initiatives. The best idea to have as an unsuccessful lawyer to grip the determination and that will surely help you. Providing interesting and informative content on a consistent bases is a point worth noting because the average twitter user follows around 200 accounts. Your tweets can easily be lost in the noise. To get more info please visit http://best-essays-writing-service.com/buy-essay/. I am really impressed or surprised by reading this heading about the Layer online marketing, means that the layer are know also used the online marketing for increasing their clients. The internet marketing is the very super way to gain the advantage of internet from all over the world. If you want the internet marketing click site. Has #Google Gone Too Far?